Milestone Mondays-Heart Transplant Recipient and Donor Family Celebrate Twenty Years! Recently, I was honored to attend Joe Stott's 20th heart transplant anniversary. Unlike other anniversaries, such as wedding or job celebrations, this one was bittersweet. 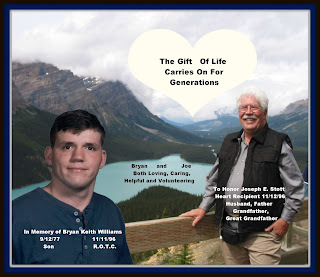 In November of 1996, Joe received Bryan William's heart. For Joe and his family, it was a miracle. "Doctors told me that I was dying. I was going to leave the hospital with a heart or in a pine box." Miles away, another family faced tragedy. Bryan was only 19 at the time. Bob and Ruth Tilley had taken Bryan in as a troubled teen and had helped him heal from his past. Bryan learned to trust again and turned his life around. He had everything going for him: well-loved, popular, high school senior, football player and on the R.O.T.C. As a matter of fact, the accident happened while he was running home to tell his family that he made the honor guard. Racing across a busy highway, Bryan never saw the car. Family and classmates crowded the hospital's ICU waiting room for days. Unfortunately, Bryan didn't make it. When the Tilleys were approached about donating Bryan's organs and tissues, they knew what he wanted. Earlier that year, one of Bryan's closest friends died of cancer. Classmates gathered at the Tilley's house and reminisced. Ruth recalled that after a while, the conversation turned. 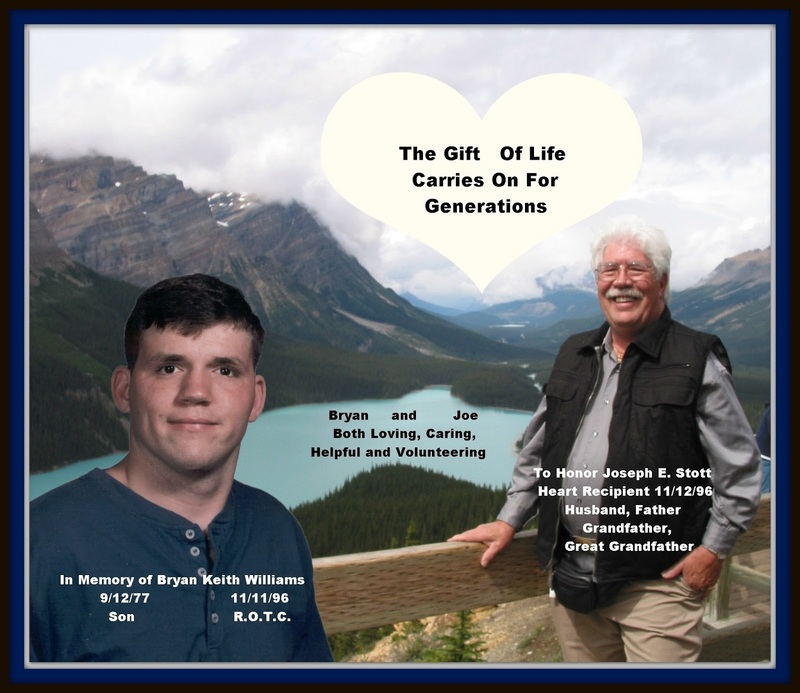 "If anything happens to me, I want my organs donated," Bryan said. Several others agreed and some voiced concerns. Bryan, however, continued to tell his friends that he was definite. He even made sure that he was registered on his drivers' license. For those who knew him, they weren't surprised. Bryan's heart immediately started to pump once it was place in Joe. The transplant was a success. Life, for both families, was never the same. A few years later, Lifelink of Georgia, made the Stotts and Tilleys wishes to meet come true. They made a real connection. Since then, both families promote organ donation registration. Joe volunteers with the Georgia Transplant Foundation as a mentor for patients and families involved in heart transplants. He and his wife, Judy, are very active in Donate Life of Georgia. As a matter of fact, last June, the Stotts and Tilleys traveled as part of Donate Life Team Georgia to Cleveland, Ohio. There, they joined over 6,000 donor families, organ/tissue recipients and living donors to participate in The Transplant Games of America. The national event is held every two years to celebrate and honor those involved in transplants. Recipients and living donors compete in Olympic-style events. I was privileged to travel to the games, as a part of Team Georgia. I have become close to both the Tilleys and Stotts. It is evident that Bryan's spirit lives on. The event included a donor family tribute. 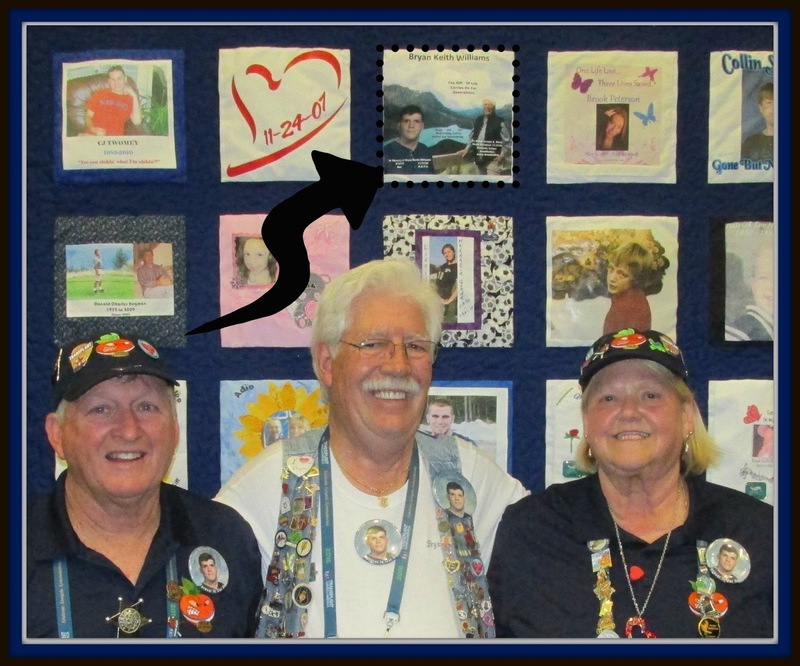 A quilt square with information about Bryan and Joe was celebrated. No dry eye here. Joe earned a silver medal in bowling. And, to bring things full circle, Bob Tilley placed the medal around Joe's neck. What about you? Have you thought about organ donation? Are you registered? If you are, make sure at least two family members know. Check to see if your license is marked. (If you have just continued to renew, it might not include this information). If you aren't registered, here's food for thought: 18-20 people die everyday while they are waiting for a life-saving transplant. As a retired teacher, that's a small classroom. My school had 29 classrooms. In one month, we could lose the equivalent of one school population. But, here's the deal: One person's organs can save up to 8 people. It can help up to 50! Registration is free and easy. Click here. Not sure if you want to sign up? Concerns? Questions? No problems. Click here to learn more. If you are registered, thank you. Please let your family know. Join me in encouraging others to register. Pray for families who selflessly choose to donate their loved ones' organs and tissues. Pray for a cure so that transplants are no longer needed. 1. My cousin, Denise, can spoil her grandchild. When Denise had her first child, her mom had already started dialysis. Denise's mom wanted to help her take care of the baby, but she could only stay for an hour or so. Progression of PKD (Polycystic Kidney Disease), along with dialysis left her exhausted. Now, years later, Denise has all the energy that she needs. 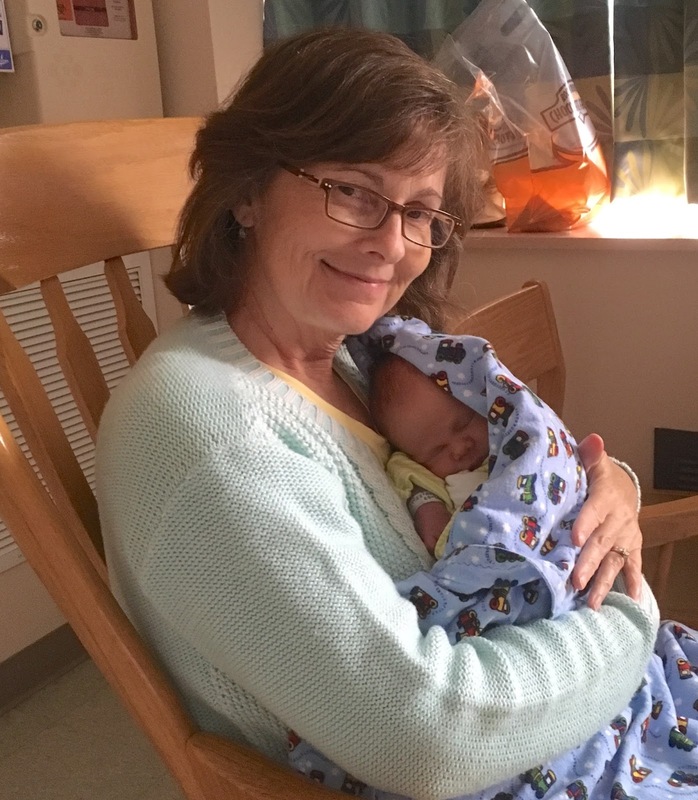 She's even going to take care of her grandson when her daughter returns to her "day job." Talk about changing family history. 2. Denise is dialysis free. Because the transplant was done before she had to begin dialysis, Denise was able to avoid it altogether. Dialysis does not offer a cure. It was originally designed to help patients while they wait for a transplant. On an average, patients on dialysis may survive 5-10 years. (There is data that many can live longer.) The transplant coordinators have said that patients who can move directly to transplant feel better sooner. 3. I feel better than ever. As her living kidney donor, the transplant team follows my medical history for two years. Most procedures are done as a laparoscopy. I have four small scars to remind me that transplants save lives. Lab work and consultations are regularly scheduled to ensure that I do well. Our second anniversary, called a "kidneyversary," is coming up this December. I feel wonderful. 4. Guess what? She'll need another one. The sad news is that there is nothing in place to maintain Denise's health for the rest of her life. Transplanted kidneys from deceased donors last an average of 7-10 years. Kidneys from living donors, like mine, may last twice as long. Denise and I are both in our 50s. Unless medical research improves, Denise may face dialysis in her 80s. 5. There is no cure for kidney disease yet. There is a lot of progress in the area of portable dialysis units, but no cure has been found. Until that happens, I'll keep advocating for living kidney donation. I would do it all again in a heartbeat. Boy Meets Girl. Boy and Girl fall in love. Girl needs kidney. Boy gives girl kidney. Boy and girl live happily ever after. Sure would be nice if life was like the movies. The reality is that there is a LOT more to kidney transplant stories than Hollywood, cable or the Tabloids lead you to believe. But there is hope. The truth is that the wait for a kidney can be extremely long. It can be filled with family tension, depression, and financial difficulties. However, it can also include a stronger sense of community, hope and answered prayer. 1. Stay in close contact with your transplant coordinator. 2. If a living donor hasn't stepped forward, consider developing a campaign to find one. The Living Kidney Donor Network can help you create one. 3. Ask about entering a paired exchange. Living Kidney Donor Network explains paired exchange. Feeling overwhelmed? That's normal. For now, consider signing up for a free newsletter with information about current trends and transplants, success stories and tips on current "Kidney Kampaigns."